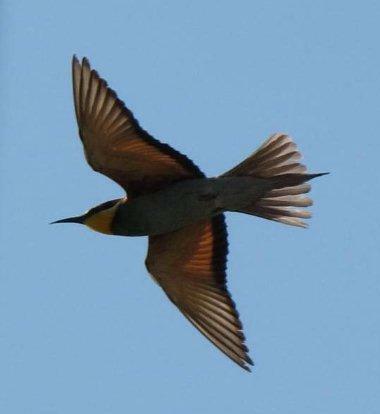 The bee eaters have been flying low around the house as if to say goodbye until next year. Normally they are high in the sky and although we know they are beautifully coloured, as we see flashes of iridescent blue and gold; we’ve never been able to see them so clearly before! 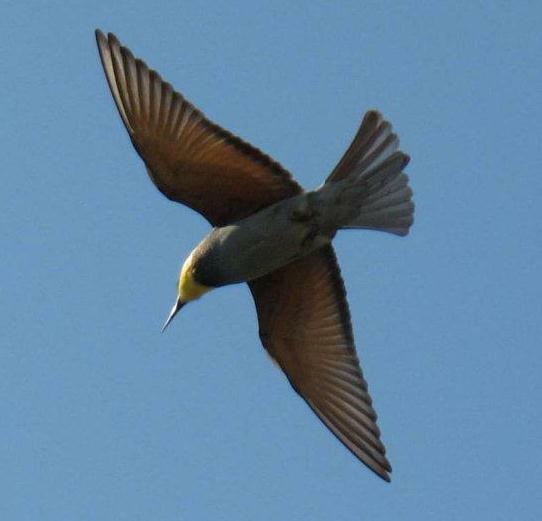 I don’t claim any credit for these photographs, my husband who is quite keen on bird watching took them. I did try, but the birds flew so fast and only hovered in a tantalising way before diving off in unexpected directions. On 15th August, GBBD I reported about the difference in the weather this year – cooler, more rain – on the 16th the weather changed completely! The daytime temperatures rose from the mid to high twenties to the high thirties and I believe one day 40° C! No rain, not even a little morning mist and the night-time temperatures were the same as the daytime ones a few days previously. Only in the last couple of days have temperatures become more tolerable – I hate the heat! 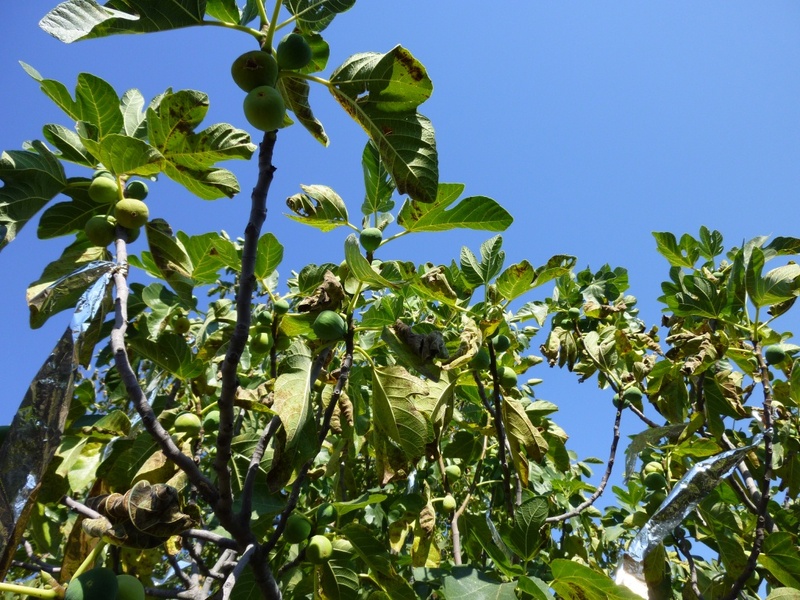 Many of the trees I had planted in 2009 became very stressed; the persimmon lost all its fruit; the fig that has always been here lost half of its leaves and the September fruit, which had been growing and ripening well, is now dropping of the tree and although we are able to eat some, many the ants get first! 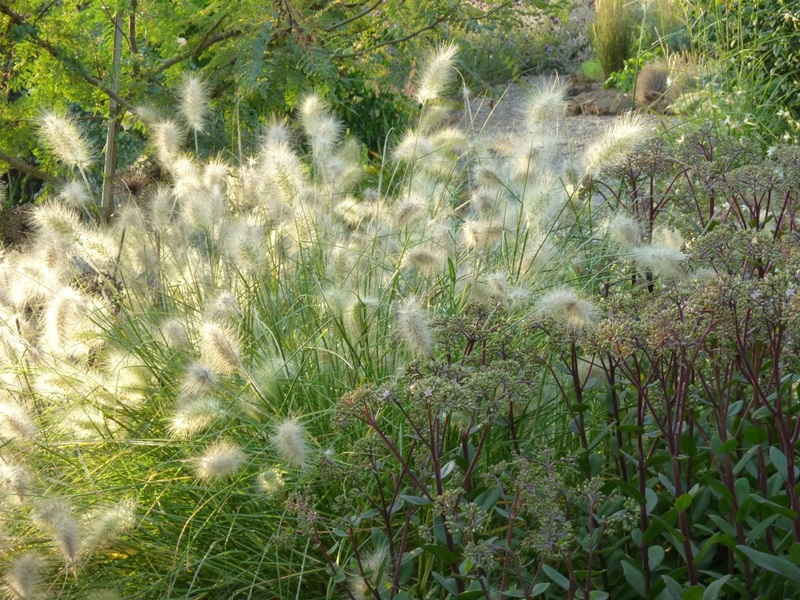 The sun sets earlier and one of the pleasures this brings is to see the grasses, most are flowering now, with their seed heads being lit from behind. I am going to make a determined effort to collect some seed and try to grow more. Many don’t need water and so would be great on the bank which is very steep and therefore always very dry; even some of the Gaura succumbed to the intense heat of the last couple of weeks. 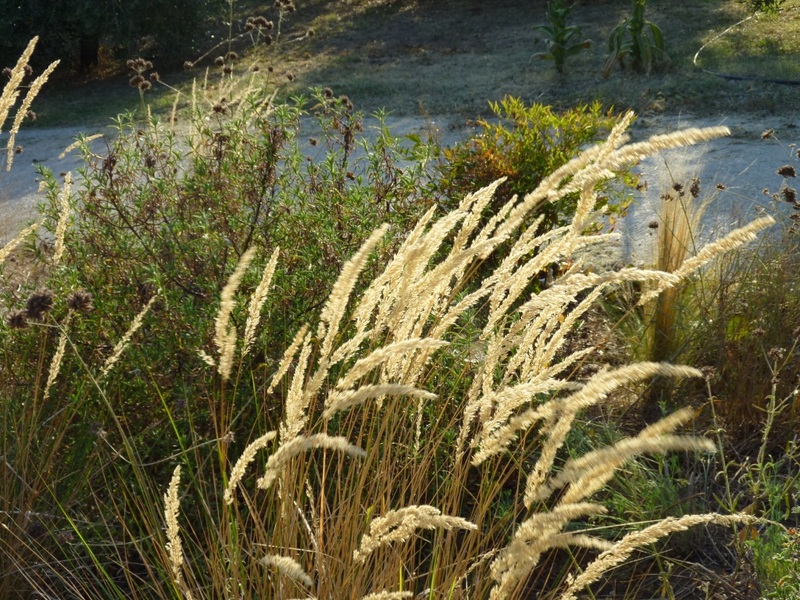 Some Miscanthus are already flowering and most are much more tolerant of drought once established than the books would have you believe. Above is either Miscanthus ‘Gracillimus’ or M. Graziella, I moved it to the circular rose bed this spring as it grew less tall where it was before and I thought it would fit better here; luckily Rosa ‘Queen of Sweden’ is also growing taller than expected and so the Miscanthus forms a pleasing division between this rose and the shorter deep coloured ‘Tradescant’. 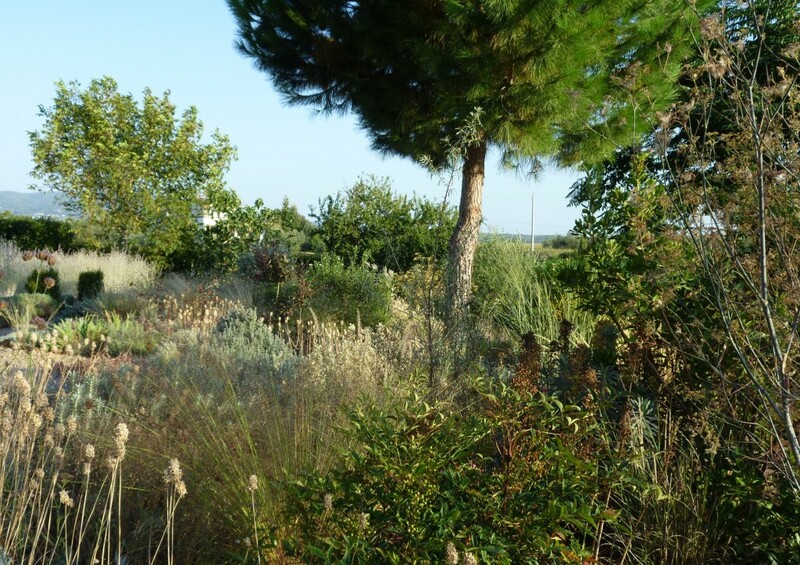 In this general view with the umbrella pine you can see how the seed heads and grasses combine with the flowers to create an overall ‘fullness’ in the garden. 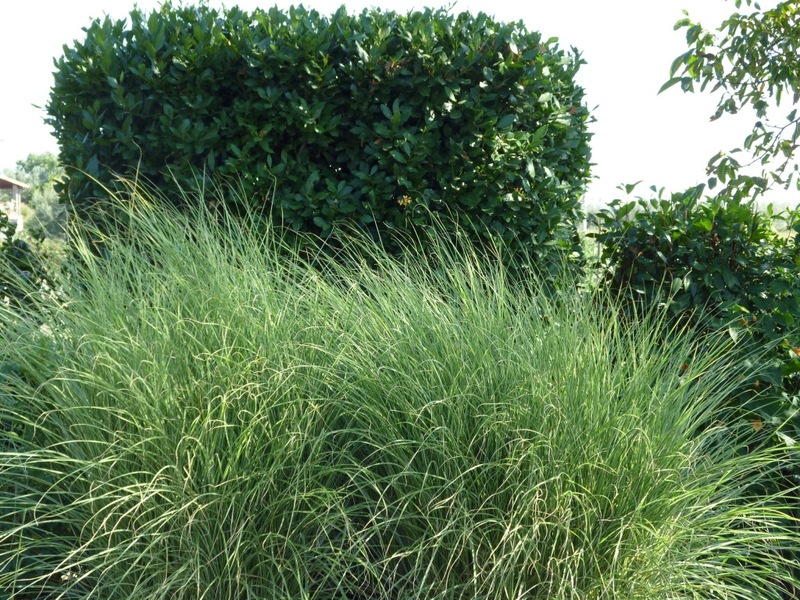 I like the very solid forms of the Box cubes and bay that contrast so well with the airy grasses and ephemeral Gaura. 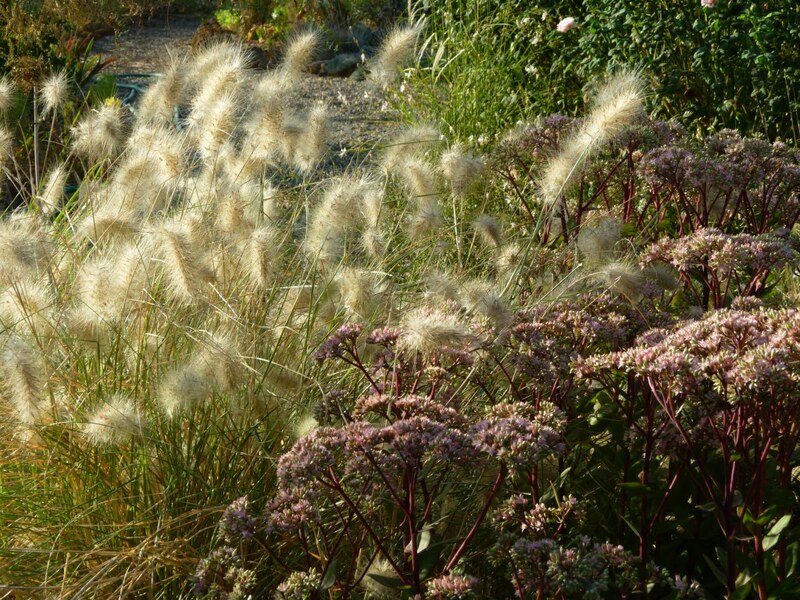 My plans for September are to divide and move some of the plants that have begun to outgrow their allotted spaces. I’ll begin next week with Irises as they won’t mind even if it stays quite hot, then some Hemerocallis that were on the list last year and are very squashed where they are now. Finally I’d like to introduce a new meme I’m starting about Foliage in the garden. It can be foliage plants that don’t flower at all, foliage when the flowers have finished, grasses which I think count as both flowers and foliage, new growth that might be very different from the mature leaves and of course we are coming into autumn (at least in the northern hemisphere we are) so I hope for some fabulous autumn colour. It will be the 22nd of each month. 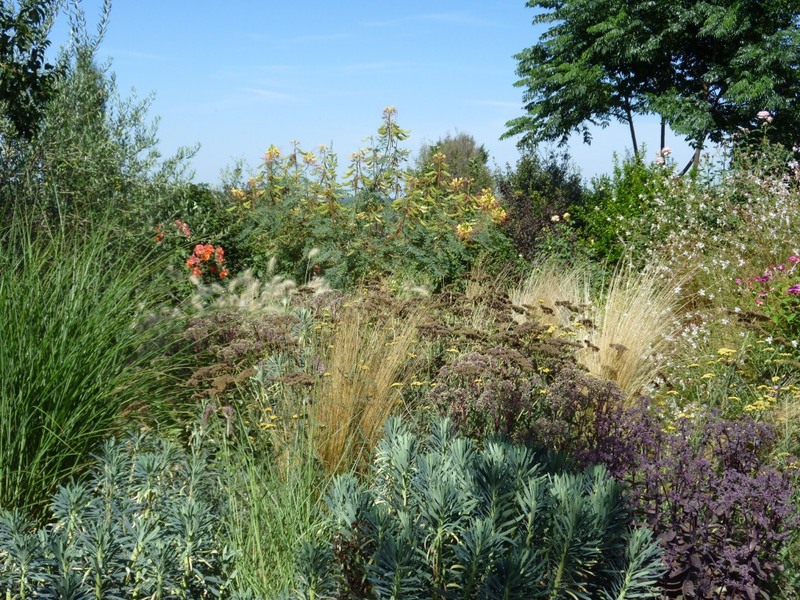 If you would like to read more about what’s happening in other gardens all over the world visit Helen at The Patient Gardener. Once again a big thank you to Helen for hosting this meme for us. I have decided to write on a regular basis about the foliage in the garden. My intention is that I’ll write on the 22nd of the month. I hope some of you might like to do the same thing so that we can compare as we do with GBBD. As you will notice I am already late this month but hey this is the first one! I also don’t know how to set up a “mister linky” but I’ll try to learn before next month! 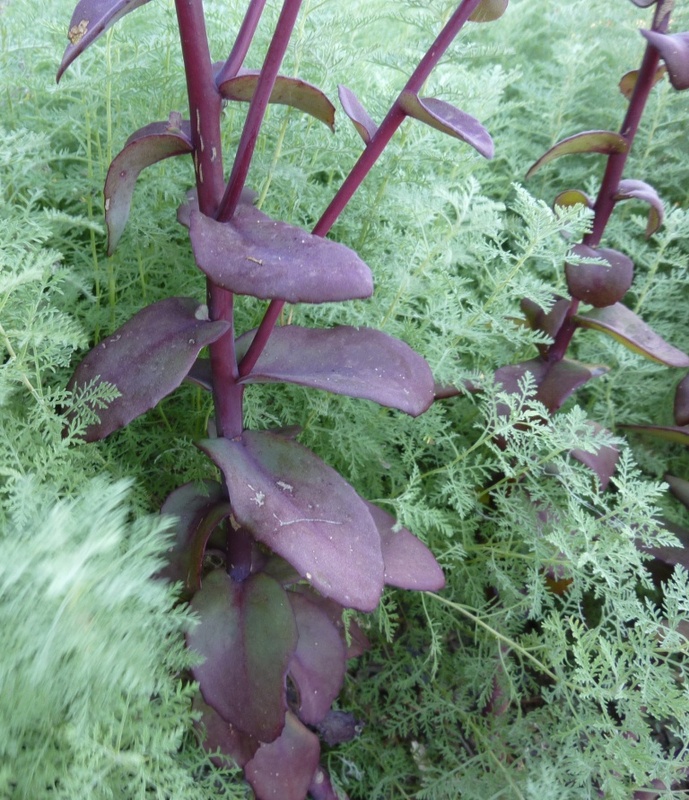 I think this image of a purple sedum and sage green Artemisia ponticum show very well how plants can work together; the solidity of the sedum versus the airiness of the Artemisia. At the back of the garden I have a solid block of bay, it doesn’t line up with the central path at the moment but it will as I’ve planted some more and am trying to be patient while they grow to extend the block; planted in front are two Miscanthus ‘Morning Light’ which move in the wind against the solid Bay. 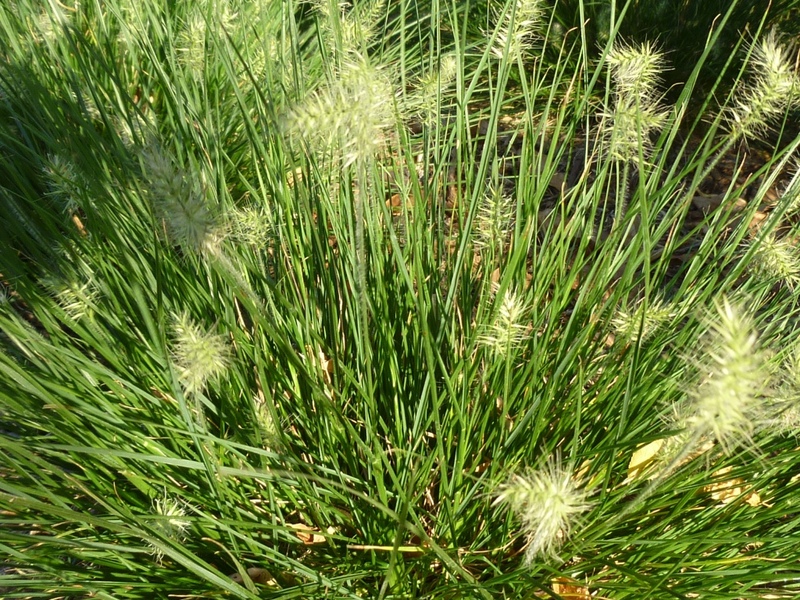 This will be even more obvious when the Miscanthus flowers – though I really think of grass flowers as foliage, but they add so much to the garden I feel it correct to count them twice! 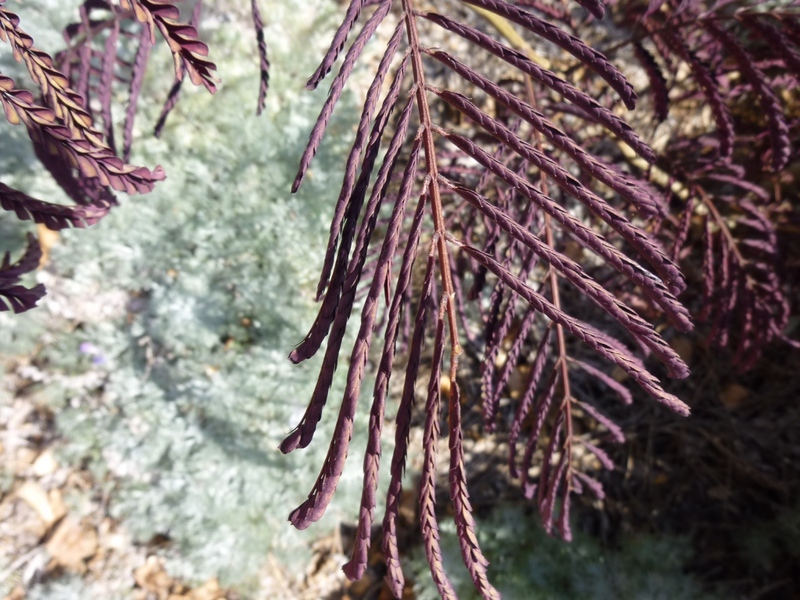 Here’s the same colour combination as above using Albizia ‘Chocolate’ and another Artemisia. When I first thought about this and walked out into the garden with the camera I wasn’t sure how much interesting foliage there would be; that was a strange thought really as I think I like my plantings more for the foliage than I do for the flowers though I do enjoy those very much too. 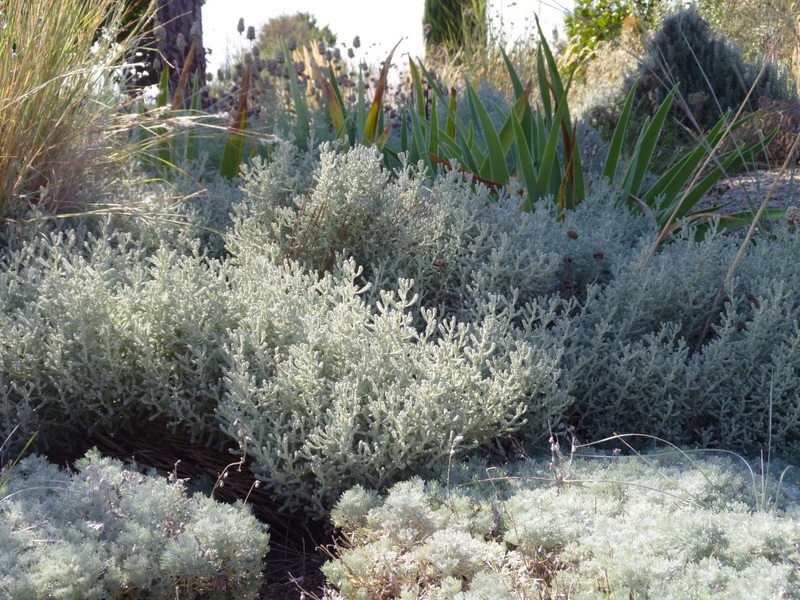 When I plan a border or area of the garden it is just as important to me that the plant has interesting textual foliage as that it has a beautiful, perfumed flower of the right colour. I don’t think there is a plant that has flowers longer than it has foliage – I may be wrong but none come to mind as I write; accepting this, then, the contribution made by the texture, form and colour of the foliage is going to have more impact on the overall impact the garden has than perhaps anything else we plant. In my post for GBBD I mentioned that we’d had a coolish summer (for Italy) with unprecedented rain during July; the temperatures in the last week have made up for that with several days of 35-37° C with a strong wind from the west and night-time temperatures only dipping to 24°C. To me it seems some plants have been lulled into a false sense of security and have not pushed their roots down further to reach the damp lower layers. Several now look very stressed and I have had to give them some water or I fear they would die. Interestingly the Italian way of saying a plant or tree has died is to say it is seccata (dried) as death through lack of water is the major cause of losing plants. 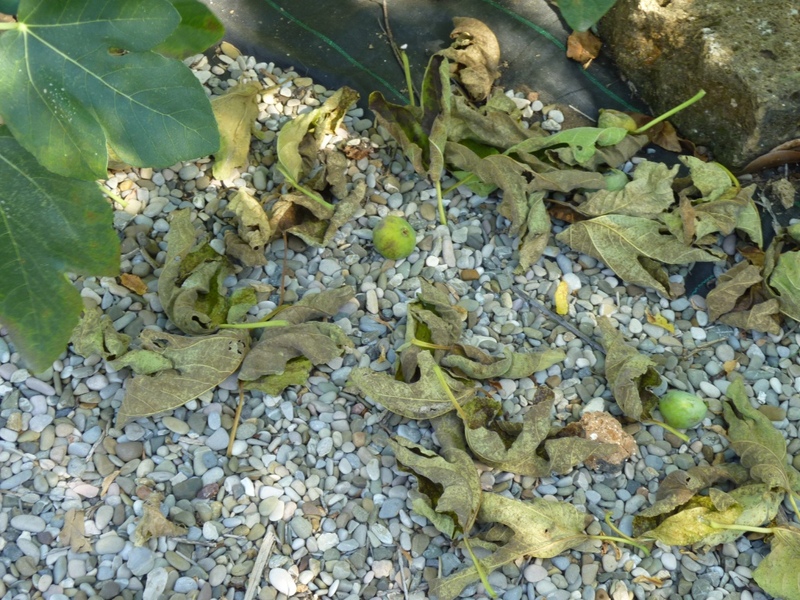 Even my fig tree is very stressed and is losing its leaves and dropping the ripe fruit; the walnut also has many leaves which frankly look scorched. 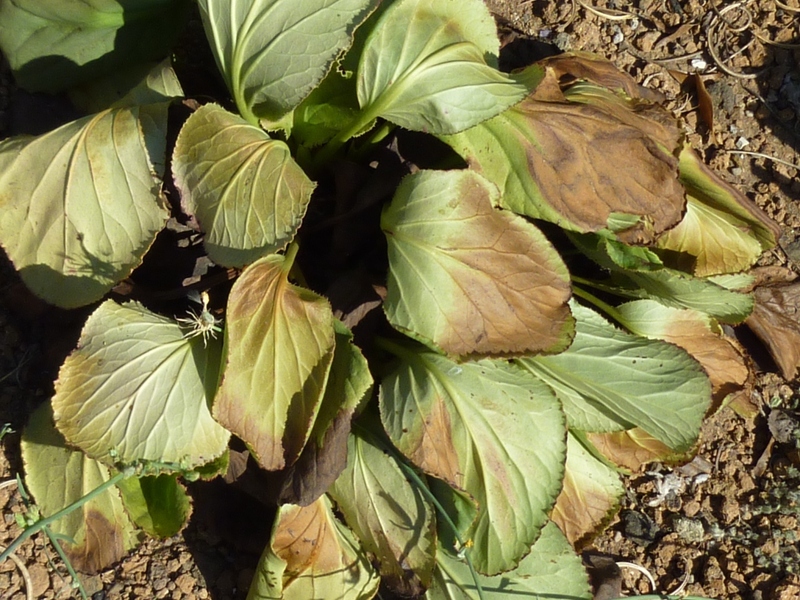 Worst is the Bergenia, I will have to move them either to a shady spot or remove them altogether as they suffer like this every year and don’t actually flower all that well either. 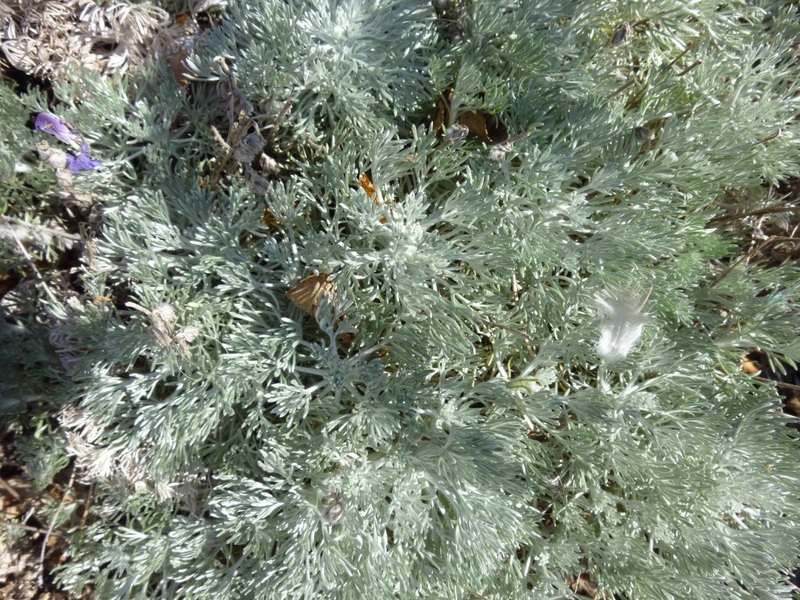 On a happier note the silver foliage in the garden is positively sparkling and glinting in the sunshine. 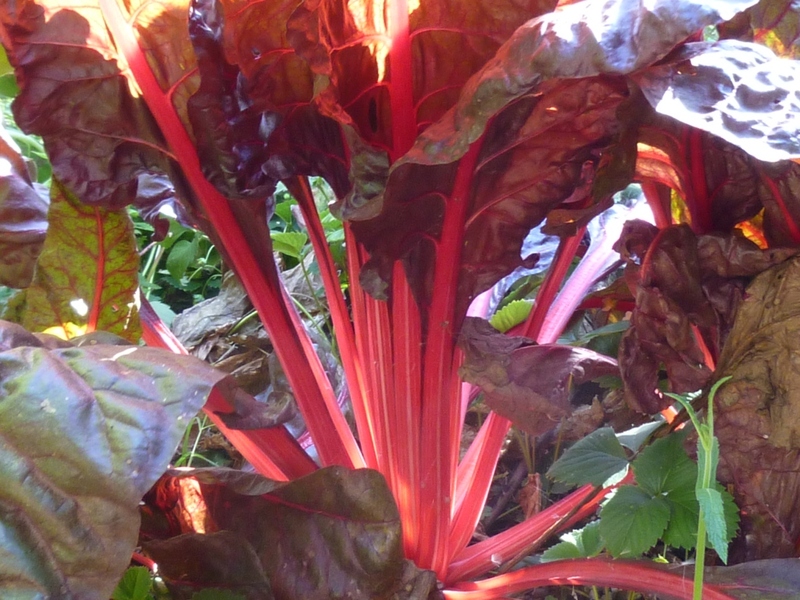 The vegetable garden can also thrill when the sun back lights the gorgeous red stems and leaves of Swiss Chard ‘Bright Lights’. Can you spot the Verbena bonariensis growing as a weed in the vegetable garden! 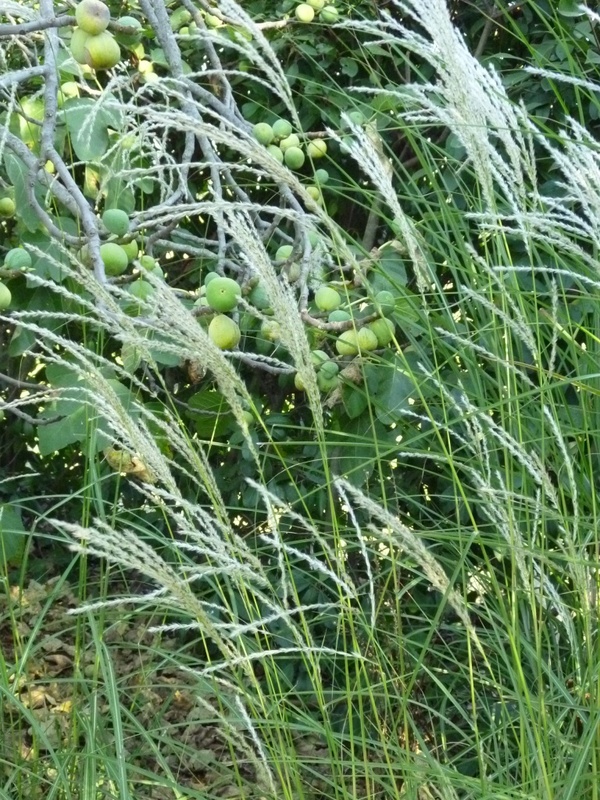 Click here to see the foliage in My Hesperides Garden today. Here’s a link to Carolyns Shade garden who has posted about her textural contasiners. http://carolynsshadegardens.com/. Today is the day when Garden bloggers all over the world share what is flowering in their gardens. To see what’s happening in other climates and even different seasons visit Carol at MayDreams. She is our host for this fascinating view of what’s happening; thank you Carol. It is also a holiday here in Italy, the last of summer and for some reason always makes me feel a bit sad – strange as usually the warm days continue until the end of October or even longer if we’re lucky. Actually this year the hot weather is forecast to begin again this week so who knows what is going to happen. How quickly another GBBD is upon us! It seems only yesterday that I was posting for July. This year has been very different in the garden. April, May and June were unseasonably hot; but during July and August the temperatures have been significantly lower than most years AND there has been rain. Very heavy rain during the first week of July and at the end and even August has also had some rain. Maybe even more significant has been that the night-time temperatures have been about 10°C lower than the norm. The garden has loved it. There are far more flowers for this GBBD than last. The garden is full of colour and texture. I suppose I am slightly surprised that even the plants chosen for their drought tolerance are actually far happier with some rain and cooler weather. I’m not sure why I should be so surprised; many of these plants also grow well in the UK with even more rain and lower temperatures. Roses have flowered for much of July and some are continuing now as you can see in the slideshow. Roses in flower now include: R. Westerland, R. Clair Matin, R. William Shakespeare, R. Tradescant, R. Queen of Sweden, R. Gertrude Jekyll, R. Sophie’s Perpetual, R. Molineux, R Rush, R. Mutabilis (this hasn’t been without flowers since April), R. Scepter’d Isle, R Stanwell Perpetual and the beautiful R. Sally Holmes whose flowers form a bouquet all on their own. 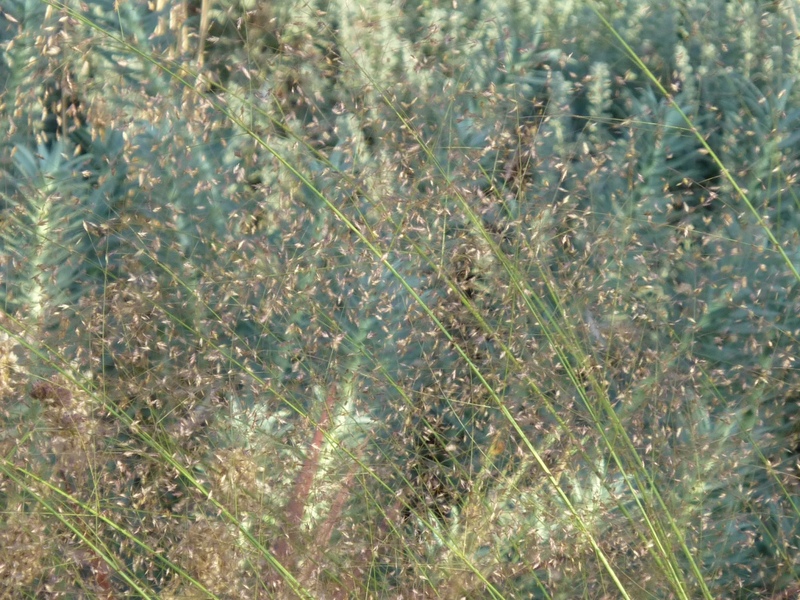 The formal beds of Perovskia have remained a cloud of blue; in the past they have lost their intensity of colour during August only to re-flower with the rains that usually come in September.
. 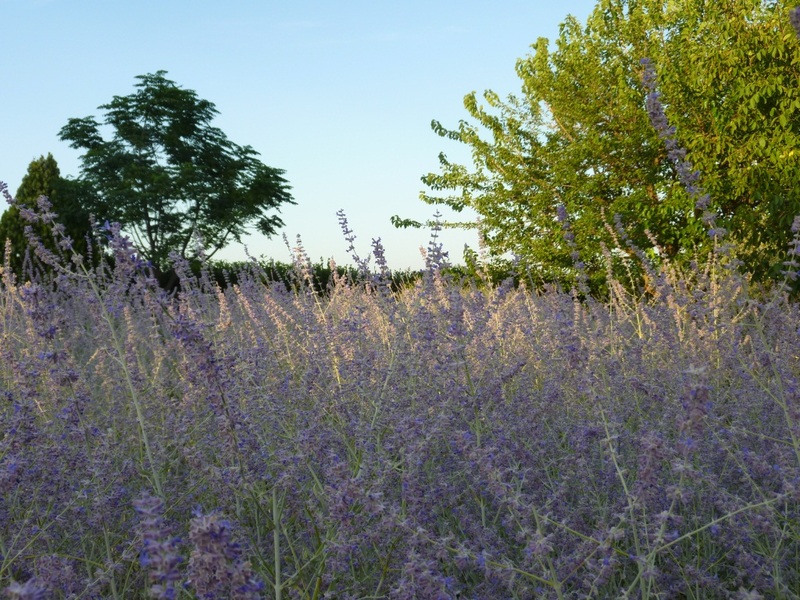 The surrounding lavender was cut back at the end of July and is already sending out new growth. I know is going to sound crazy but I actually prefer the lavender when it is pruned into a neat hedge than when it full of flower and bees. I am considering removing the Lavender and putting in Myrtle but they are expensive so I would need to produce them myself from cuttings. Knowing how slowly they grow this just might take too long! 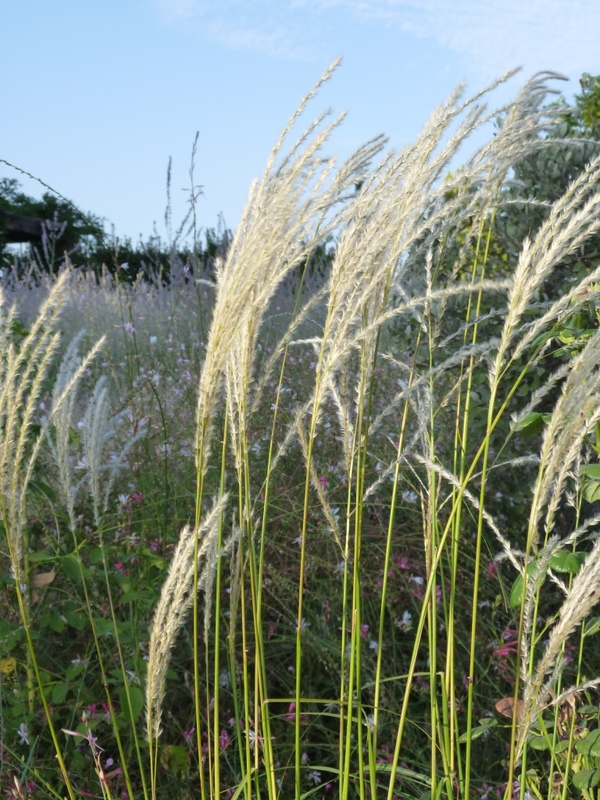 All the grasses are looking lovely, I may have said it before but it remains true that I think I could be happy just gardening with grasses. In the Small Island I added two more Penisetum villosum to the one existing plant; last year this formed a very beautiful mound and I thought that three would make a good statement – I acted without knowing the this Penestum was obviously very happy in this particular spot and this year is huge almost filling the space I envisaged for three plants; I’m happy though because they have all been in flower for a while now and I love the soft bottlebrush heads especially in the evening light with the fading sun behind them. I am amazed that the Abutilon that was dead to the ground from the cold winter (it had been a large bush of about 1.8 m by 1.8 m) has grown from the base and is now about 1.5 m high although of course not such a large spread yet but it is flowering! 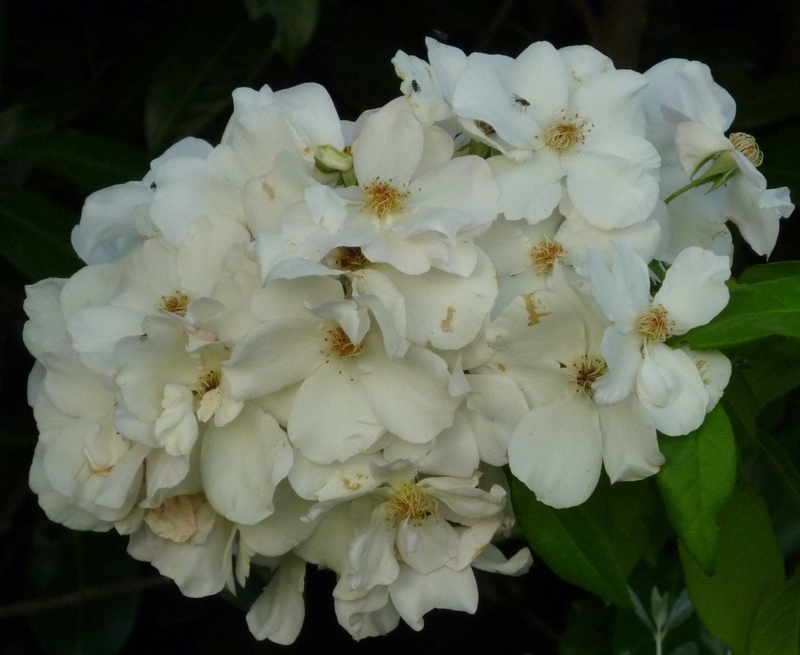 Click here to see a slideshow of all that is flowering in my Hesperides Garden. Happy GBBD to everyone who shares the blooms in their garden today.